(Bloomberg) -- President Donald Trump vetoed on Tuesday a bipartisan measure passed by Congress earlier this month demanding that he withdraw U.S. support for the Saudi-led war in Yemen, the White House said in a statement. “This resolution is an unnecessary, dangerous attempt to weaken my constitutional authorities, endangering the lives of American citizens and brave service members, both today and in the future,” Trump said in a message to lawmakers released by the White House. Trump’s veto strikes down a measure that represented an implicit rebuke of the president for his continued support of Saudi Arabia after the killing of U.S.-based columnist Jamal Khashoggi. 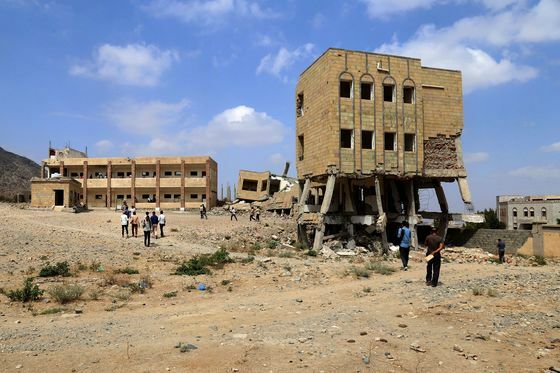 The resolution -- which called for the president to remove U.S. armed forces from hostilities in or affecting Yemen within 30 days unless Congress authorized further engagement -- passed the House about two weeks ago following Senate approval in March. Both chambers failed to reach the two-thirds majority needed to override Trump’s expected veto. In his message Tuesday, Trump defended limited U.S. support of the Saudi-led coalition’s war against Houthi rebels as essential to protect Americans living in the region and fend off the potential influence of Iran. He said the resolution was unnecessary because there are no U.S. troops “commanding, participating in, or accompanying” the Saudi-led coalition in the hostilities. Trump said the U.S. has provided intelligence sharing, logistics support and until recently in-flight refueling of allies’ aircraft. Those activities, Trump said, are consistent with the Arms Export Control Act as well as the president’s constitutional authority as Commander-in-Chief. The U.S. ended aerial refueling support to the Saudi-led coalition in November, one of the most controversial elements of U.S. policy in the region due to civilian casualties from errant airstrikes. But the Trump administration has argued against ending arms sales to the coalition or otherwise place constraints on assistance, maintaining that continued support is key to the peace process. House Speaker Nancy Pelosi condemned Trump’s veto. "The President has cynically chosen to contravene a bipartisan, bicameral vote of the Congress and perpetuate America’s shameful involvement in this heartbreaking crisis," the California Democrat said in a statement issued by her office. Senators have been pushing for increased sanctions on Saudi Arabia even as Trump has emphasized the importance of the U.S. alliance with the kingdom and insisted that it’s uncertain whether Crown Prince Mohammed bin Salman ordered Khashoggi killed. Khashoggi, a U.S. resident and columnist for the Washington Post, was strangled at the Saudi consulate in Istanbul in October 2018 and his body was dismembered, the city’s chief prosecutor has said. The Senate unanimously assigned blame for the killing to Prince Mohammed on the same day it passed the Yemen resolution for the first time. That measure was never taken up by the Republican-controlled House. The war in Yemen, which just passed the four year mark, has produced what United Nations officials call “the worst man-made humanitarian crisis of our time.” Members of both parties in congress, including Trump allies Rand Paul and Mike Lee, have called for the end of U.S. involvement in the conflict. The resolution was also billed as a concerted effort on the part of lawmakers to wrest Congress’ constitutional authority to declare war back from the executive branch. Democratic Representative Ro Khanna of California -- who introduced the House version of the measure -- called it an "historic" vote. "This is important not just for Yemen, where 14 million children and women, civilians face famine but it’s also important in Congress reasserting our role in matters of war and peace," Khanna said. "The United States Congress today has spoken loudly and clearly that this crisis must end." The Senate first passed the resolution toward the end of the last Congress but it was never taken up by the House, which was then controlled by the Republicans. After Democrats took control of the House, they passed a measure in February, but Republican lawmakers were able to change the underlying resolution in a parliamentary maneuver. The Senate voted again on the resolution in March, when seven Republicans joined with Democrats to pass the measure 54-46, giving it far from a veto-proof majority in either chamber. The House passed the measure on April 4 in a 247-175 vote. Trump’s veto of the Yemen measure was the second of the administration. He used his first to reject a measure aimed at halting his national emergency plan to fund a border wall.